Ambrose Bierce put together the original in the mid-1800s, but Tom Engelhardt thinks it's time for a new edition, to keep up the pace with the Imperials' frenzied pursuit of redefining language to mean whatever they want it to mean, and nothing else. Democracy n: A country where the newspapers are pro-American. Free Press: 1. Government propaganda materials covertly funded with a quarter of a billion dollars of taxpayer money but given out for free to the press and then broadcast without any acknowledgment of the government's role in their preparation. Friday's Washington Times carried a piece by Greek foreign minister Petros Molyviatis, unimaginatively titled "Back to Kosovo: Athens' view." The moment Molyviatis mentions the 1999 war as "dramatic events," it becomes obvious something is seriously wrong. Indeed, the Greek FM suffers from a terminal case of absurd terminology. To him, the 2004 pogrom was "incidents;" Kosovo is a "country;" and security of Serbs, their property, and the Orthodox temples "remain major concerns," instead of being nonexistent. "Fostering democracy, respect for human rights and—especially—minority rights, as well as good governance, have been the great challenge from the outset," says Molyviatis. "The international community’s initial goal of a stable, democratic and multiethnic Kosovo has not yet been achieved." Challenge? More like an abysmal failure - even if these have been the goals of the so-called international community (what does that mean, anyway?). What is so challenging about some 40,000 occupying NATO troops failing entirely to prevent the ethnic cleansing of non-Albanians, the plunder and destruction of their property, and the ongoing murder and violence against those who remained? All they had to do is stand and watch - a duty they performed superbly. Despite all this, Molyviatis wants Belgrade and the Kosovo Serbs to become "involved" - i.e. collaborate with the occupation, offering a smarmy quote supposed to be a proverb: "the absent are always in the wrong." Huh? It would be easy to say that Petros Molyviatis must have fallen off the stupid tree, hitting every branch on the way down. He is, however, Athens' foreign minister, and the editorial was titled "Athens' view." So this is not just his, but the Greek government's agenda. Its goal becomes obvious at the end of the article, when Molyviatis starts extolling the virtues of Greece as the best mediator for Kosovo, "as a member of the EU and NATO, as a member of the U.N. Security Council for 2005-2006, as a friend and ally of the United States, and as the chairman in office of the South East European Cooperation Process. And, of course, as a country with strong bonds of friendship and cooperation with all Contact Group members." What this amounts to is Athens trying to score points with the EU and the Empire, while trying to appease Albanian territorial aspirations by throwing them the Kosovo bone and hoping the "Chamerian Liberation Army" never comes into being. This is both stupid and wrong - but I suppose the Greeks are about to find that out the hard way. As for the Serbs who hoped for some kind of "friendship" with Greece, they should remember the crucial difference between the people and the State: while people may have friends, the State has only interests. If the Greek State had been friendly, it would have vetoed the 1999 bombing. Enough said. 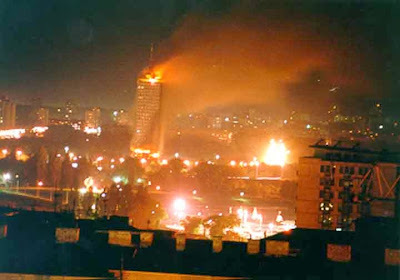 Six years ago today, NATO attacked what was then Yugoslavia. Alliance leaders claimed all sorts of reasons and justifications for their act of aggression, from political extortion (initially) to "helping the refugees" (who just conveniently happened to be under the thumb of their allies, the terrorist KLA). On May 14, 1999, Empress Hillary Clinton went to visit the Albanian refugees in Macedonia. BBC ran this picture with the article about the visit. The shape in the middle is Kosovo. On the right side is the Albanian eagle. The "UCK" is the Albanian acronym of the KLA. Are further comments really necessary? It is today, nearly six years after NATO and the UN took over Kosovo. An elderly Albanian couple is sitting in their dark flat in Pristina. The electricity is out, yet again, and they are sitting in front of a blank television, lights out, food beginning to rot in the refrigerator which isn’t running, no hot water, and certainly no cooking to do. They are just sitting there, wondering what to do next when all of the sudden, the crackle of electricity is heard when the lights begin to flicker. The television comes to life, the hum of the refrigerator can be heard and the water heater starts up. This really says it all, on so many levels. I don't feel much like the Stasi. Otherwise, I find a lot of truth in Tina Brown's assessment of the "eggshell era," the current climate in which anyone who aspires to public life of any kind lives in constant fear of committing thoughtcrime according to constantly shifting perceptions. Every word out of a public figure's mouth is a hostage to fortune. Every private e-mail is a bomb that could blow up your life. [...] We are in the Eggshell Era, in which everyone has to tiptoe around because there's a world of busybodies out there who are being paid to catch you out - and a public that is slowly being trained to accept a culture of finks. We're always under surveillance; cameras watch us wherever we go; paparazzi make small fortunes snapping glamour goddesses picking their noses; everything is on tape, with transcripts available. No matter who you are, someone is ready and willing to rat you out. Even the rats themselves have to look over their shoulders, because some smaller rat is always waiting in the wings. Bloggers are the new Stasi. All the timidity this engenders, all this watching your mouth has started to feel positively un-American. She's definitely got a point. 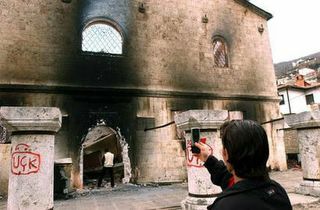 One year ago: An Albanian urinates on the ruins of the burned Cathedral of St. George in Prizren, after the March 17, 2004 pogrom. Graffiti celebrating the "Kosovo Liberation Army" are scrawled on the ruined fenceposts. Another Albanian, armed with a cell-phone camera, immortalizes the sight. The first time I read this, I was reminded of the European Union, which I only semi-jokingly call "Soviet" nowadays. The book it comes from is the fifth in a space-opera series (of which I will admit to being an unabashed fan) by David Weber. All emphasis added. There'd been a time when the Republic of Haven—not "the People's Republic," but simply "the Republic"—had inspired an entire quadrant. It had been a bright, burning beacon, a wealthy, vastly productive renaissance which had rivaled Old Earth herself as the cultural and intellectual touchstone of humanity. Yet that glorious promise had died. Not at the hands of foreign conquerors or barbarians from the marches, but in its sleep, victim of the best of motives. It had sacrificed itself upon the altar of equality. Not the equality of opportunity, but of outcomes. It had looked upon its own wealth and the inevitable inequities of any human society and decided to rectify them, and somehow the lunatics had taken over the asylum. They'd transformed the Republic into the People's Republic—a vast, crazed machine that promised everyone more and better of everything, regardless of their own contributions to the system. And, in the process, they'd built a bureaucratic Titan locked into a headlong voyage to self-destruction and capable of swallowing reformers like gnats. […] The Legislaturalists' parents and grandparents had taken too many workers out of the labor force in the name of "equality," debased the educational system too terribly in the name of "democratization." They'd taught the Dolists that their only responsibilities were to be born, to breathe, and to draw their Basic Living Stipends, and that the function of their schools was to offer students "validation"—whatever the hell that was—rather than education. And when the rulers realized they'd gutted their own economy, that its total collapse was only a few, inevitable decades away unless they could somehow undo their "reforms," they'd lacked the courage to face the consequences. Perhaps they … actually could have repaired the damage, but they hadn't. Rather than face the political consequences of dismantling their vote-buying system of bread and circuses, they'd looked for another way to fill the welfare coffers, and so the People's Republic had turned conquistador. The Legislaturalists had engulfed their interstellar neighbors, looting other economies to transfuse life back into the corpse of the old Republic of Haven, and, for a time, it had seemed to work. Catholic Croats in Bosnia are feeling "written out of the script," according to IWPR's Marcus Tanner, writing in today's Independent. Says Tanner, "no one can dispute that the Catholic church faces extinction in much of the country, outside a triangle of land in the barren hills of Herzegovina on the Croatian border, where Bosnian Croats rule the roost." The Catholic hierarchy waxes nostalgic about the Austro-Hungarian occupation (1878-1918), when Catholics were on top in Bosnia. Almost 25% of the population then, they are clinging on to 10% now. The predictable culprit is quickly identified: the Serbs. "The Serbs won’t let returnees go home," says Fr. Mato Zovkic, vicar of the Sarajevo archdiocese. Hogwash. No one can really block refugee returns in today's Bosnia, where Viceroy Ashdown is lording it over the Serbs in particular with an iron fist. What Zovkic and Tanner do not mention is that Croats now control and inhabit areas in the west of Bosnia and in the Krajina region of Croatia, that were until recently almost entirely Serb, and have been thoroughly ethnically cleansed. If Croats aren't returning to their homes in Serb-controlled territory, it's because they've been given Serb properties in Croat-controlled territory. In their misguided obsession with the Serbs, neither Tanner nor Zovkic, nor the Cardinal VInko Puljic in Sarajevo, so much as touch the main problem of Croats in Bosnia. Even Fra Marko Orsolic, the dissenting Franciscan who criticizes the Jesuit-dominated hierarchy for "a history of too-close ties to the forces of Croatian nationalism and their main party, the Croat Democratic Union [HDZ]," misses the point, even if by an inch. The Bosnian Croats' main problem have never been the Serbs, but the Muslims. More specifically, the ideology of majoritarian rule over a centralized Bosnian state, adopted throughout the Muslim political spectrum. This ideology was championed by the late Alija Izetbegovic, who enjoyed the support of HDZ - but more importantly, the vast majority of Croats, regardless of party affiliation - for an illegal and unilateral declaration of independence that touched off the Bosnian War. In 1992, the HDZ leadership in Zagreb (of which the Bosnian branch was a mere satellite) considered as their main enemy the Serbs (both those native to Croatia and in general) and supported Izetbegovic as the enemy of their enemy. But while regional ethnic autonomy or secession were taboo in Croatia, in Bosnia these ideas were in the Croats' best interest. Once the principle of ethnic democracy was established, only some form of ethnic federalization could prevent the tyranny of the central, Muslim-dominated government. This was the idea behind the Serb cantonization proposals, which the Croats initially backed. But between the historical grudges (Croats blamed Serbs for ending the Austro-Hungarian bonanza, Serbs blamed Croats for a brutal WW2 genocide, when Bosnia was part of the "independent" fascist Croatia) and the ongoing war in Croatia proper, the Croats of Bosnia sacrificed political prudence and joined forces with Izetbegovic's SDA. Once they figured out they had been used - by early 1993 - they clashed with the Muslims. They were losing, slowly but steadily, when the United States bailed them out from the frying pan - and into the fire - with the 1994 Washington Agreement. This pact created a Muslim-Croat alliance against the Serbs, and established today's "Federation of Bosnia and Herzegovina" (which, rumors still abound, used to be called "Federation of Bosniaks [Muslims] and Croats [Hrvata]," hence the same initials: FBiH). The 1995 Dayton Accords established the Federation as one of the Bosnian "entities." But subsequent erostion of the Dayton Constitution - always benefiting the Muslim centralizers - eliminated what few provisions the Croats had protecting their ethnic rights vis-a-vis the Muslim hypermajority. Yes, hypermajority - when seen in the framework of the Federation, anyway. In 1991, Muslims had been 43% of the total population of Bosnia, a plurality with which Izetbegovic was unable to impose his centralist program even if he had the support of all of them. And he didn't - only the war allowed him to homogenize Muslim public opinion and establish near-total political control; one is tempted to say he knew this and pushed for war deliberately, but that is another topic for another time. The point is, Izetbegovic could not have pursued his belligerent majoritarian agenda without Croat support. Between the SDA and the HDZ members of parliament, Izetbegovic had a 60-percent supermajority that allowed him to claim legitimacy when he illegally pushed through an independence referendum. Though the mujahedin who cut a bloody swath through Bosnia fighting for Izetbegovic would disagree, the religious aspect of the Bosnian conflict was perhaps the least important. The fundamental issue in Bosnia has been a clash of two political principles: centralism (exemplified by Izetbegovic's concept of "unified," Muslim-dominated Bosnia) and self-government, which was the basis of both Serb and Croat policies. It is a tremendous irony that by seeking to harm the Serbs the Croats actually harmed themselves, by helping the centralizers at the expense of self-government. Now they complain about the fruits of their struggle, without realizing what exactly they had planted and when. And they still have the knee-jerk response to lash out at Serbs (though the Serbophobic Tanner may have something to do with it). I fully sympathize with their plight, but they should stop the gripe-fest and wake up to their own responsibility in the matter. Maybe then they can do something about it, instead of complaining to hacks employed by the Empire, which - let's remember - very much helped them get into the present mess. The state’s relentless efforts to regulate and micromanage the lives of people frustrates goal-directed behavior and, as a consequence, produces the anger and violence that manifests itself in so many sectors of modern society. Now doesn't this just make more sense than all the pseudo-philosophical hokum we hear from the legacy media? This is also the first time I've seen the phrase "state-supermacists" to describe people who follow and worship the state. It's much more descriptive than "statists," and I intend to use it with alarming regularity. Is there some sort of unholy alliance between the NY Times/International Herald Tribune and the International Crisis Group (ICG)? It seems hardly a week goes by without the IHT publishing at least one editorial by ICG board members, sympathizers or partisans, recycling the Group's message about the "independence" of occupied ("liberated," in their parlance) Kosovo. The latest in this string of atrocities is an op-ed by one John Norris, a "special adviser to the president" of the ICG, who spins the indictment and surrender of Ramush Haradinaj as a "stern test of maturity" in Saturday's IHT. I'll give the Imperials one thing: they sure can talk pretty. Norris's prose is very persuasive, if one forgets for even a minute that he traffics in euphemisms alone. Indeed, the vocabulary of the editorial consists almost exclusively of select spin-words and phrases. Thus Ramush is not an "indicted war criminal" like other ICTY prisoners, but a "wildly popular prime minister who has generally said and done all the right things while delivering on a wide array of requests made by the UN administration." The anthropomorphic Kosovo (conjured as a more acceptable image than the KLA, or Albanians) "has languished awkwardly in a netherworld, uncertain whether it would become a country, remain a protectorate indefinitely or be forced back into a desperately unhappy and manifestly unworkable union with Serbia." Notice the use of "forced", "desperately unhappy" and "manifestly unworkable" to describe Kosovo's proper legal status. Brilliant! When Norris says "many international officials wonder if prosecutors in The Hague lost sight of the forest for the trees in going after Haridinaj [sic] at this exact moment," one is not supposed to ask whether these unnamed multitudes reflect only the Albanian partisans hand-picked by the ICG. Similarly, one is not supposed to understand that the "growing body of sentiment that Kosovo should be granted conditional independence" is actually the KLA/ICG position, presented here as self-evident truth. "Rather than lashing out in anger, they need to understand that the end game for their aspirations is here, and that by continuing to hold their anger in check, avoiding attacks on the Serb minority and forming a government that can make real progress on international standards, they can show they are ready to assume the mantle of statehood." He follows this up with an appeal to Ibrahim Rugova and Hashim Taqi to "rise above a long history of mutual animus and political rivalry." (Political unificiation of Albanians is somewhat of an ICG fetish, yet they go out of their way to deny its ultimate logical outcome, Greater Albania.) And there you have it, the message every Albanian partisan in the West has been shouting for the past week: keep it cool, play along, and you'll get what you want. Two questions spring into a skeptical mind. Why say this in the IHT, and not, say, Koha Ditore or Kosova Sot? The NY Times' European avatar is hardly the Kosovo Albanian daily of choice. So, Norris is making his pitch for the benefit of Western audiences as much as that of the Albanians. The second question is whether another pogrom on the scale of March 17, 2004 would really be such a threat to the Albanian cause. The initial outrage with the raging mob was quickly spun into momentum for accelerated status talks. The ICG itself argues that to delay independence would provoke bloody Albanian violence. Would proof not help their argument? This, in turn, suggests that while the message to the Albanians may well be genuine, its originators are hedging their bets and preparing the groundwork for another pogrom, which they could blame on "irresponsible elements" among the Albanians or better yet the Serbs, labeled by Norris and others as the only possible beneficiary of further violence. So whether there is a pogrom or not, the ICG has its bases covered. Chris Deliso of Balkanalysis.com does a number on CNN and its disgraced chief exec, Eason Jordan - not for Jordan's alleged comments in Davos about US targeting journalists that forced his resignation, but for CNN's inexcusable whoredom in peddling the Imperial war in Kosovo, almost 6 years ago now. It's as if Rummy was fired after being found to have a predilection for prancing around in little pink tutus, instead of for causing the needless deaths of tens of thousands. The piece, today on Antiwar.com, is a real treasure. Robert Higgs of the Independent Institute engages in a fascinating exercise today on LewRockwell.com, presenting a template for the current Iraq war/occupation. He then reveals that the text was cribbed entirely from a 1979 Walter Karp book on the 1898 Spanish-American war! The comparison between Bush the Lesser and William McKinley is eerie. To gain popular support for so useless a policy [as attacking Serbia] Democrats were unrelenting in their efforts to arouse jingo sentiment in the country. The Republicans too, were eager for a foreign adventure. . . .
the American people could indeed be diverted from their domestic concerns if the right sort of foreign crusade was offered. By inciting hatred of [Milosevic], by crying up interventionist pretexts, by encouraging the [Albanians] to prolong their struggle, by entangling America officially in [Serbian] affairs, the interventionists bent themselves to the task of turning passive, if promising, sympathy [for oppressed Albanians] into active, fighting support.
. . . interventionist sentiment ran strong in both parties.
. . . there was nothing independent about the American press. It was, overwhelmingly, a party press, a press that echoed to the point of slavishness the policies and propaganda of one or the other major party. Of the mendacious warmongering journalism of the American press, suffice to say that everything that would inflame public sentiment against [Milosevic's regime] was prominently reported, exaggerated, or fabricated. There was nothing subtle about [Clinton's] dealings with [Serbia]. From the start he claimed the right to dictate [Serbia's] conduct . . . and to intervene by force should that conduct fail to meet the American government's approval. The Democrats, by now, were a united, vociferous war party . . . .
. . . the [Racak "massacre"] wrought a profound change in American public sentiment. Although the [Racak "massacre"] produced no clamor for war [against Serbia], it had made the great majority of Americans impatient for the first time to see matters settled in [Kosovo], by American intervention if necessary. The American ultimatum [to the Yugoslav government] was harsh. Had [Clinton] been seeking a peaceful solution, the [Yugoslav] concessions certainly provided the basis for one. Few sovereign nations have ever made such concessions to a foreign power in peacetime over their own internal affairs. It availed [Belgrade] nothing. Popular support for the war was more than overwhelming. It was joyful, exuberant, ecstatic. Americans greeted the war in a tumultuous holiday spirit . . . .
What was there to fret about? America was good! America was true! [Stop the genocide in Kosovo!] In that spirit, generous and giddy, righteous and irresponsible, the American people rallied to war against a fifth-rate power under the leadership of their ostensibly peace-loving President. To conquer and rule [Kosovo] as [a de facto] American [protectorate] was [Clinton's] principal war aim. The [U.S. armed forces] . . . . in about [11 weeks'] time, . . . . destroyed the hapless hulks that passed for the [Yugoslav civilian infrastructure]. The battle was no more perilous than target practice since [U.S. bomber crews and cruise missile crews] simply fired at will out of range of the [Yugoslav] guns. . . . News of [quick U.S. victories] sent the populace into a fit of ecstatic rejoicing. Logic is no help to the vanquished. . . . international law is no help to the vanquished either. Reluctant acceptance of a fait accompli was the keynote of the propaganda campaign. . . . The American people were invariably described as already demanding what the propagandists were trying to get them to accept. The debasement of language by political mendacity was never more aptly illustrated than in the [humanitarians'] desperate pretense that imperialism was a popular movement. . . . Above all, the propagandists, again following [Clinton], made frantic efforts to deny any imperialist intentions. . . .
America's control of [Kosovo], so the propagandists insisted, brought distasteful but unavoidable "duty" in its train, namely the duty to rule [Kosovo, until the "final solution" is achieved]. . . . [Clinton] himself sternly repudiated the term "imperialism." . . . If America was becoming an imperial power, it was an empire purely by inadvertence. So the propagandists insisted. Had the [Republicans] marshaled their party strength against [Clinton's] designs, those designs would never have succeeded. Even without a Republican opposition, the American people, with nothing to guide them save ceaseless [war] propaganda, were painfully divided and confused about [Kosovo]. Even at war's end, with the American flag flying over [Pristina], there was no grass-roots demand for retaining [Kosovo] and no evidence that a majority even favored it. . . . For the success of [Clinton's] imperial design the silent complicity of the [Republicans] proved decisive. Nothing further, Your Honor. The defense rests. The already noxious London IWPR (Institute for War and Peace Reporting) ventured yet again into criminal propaganda this week, making charges that Serbia is "anti-Semitic." To a nation that has the highest percentage of "righteous gentiles" recognized at Yad Vashem, and has suffered horribly right alongside the Jews in the death camps of WW2, this slur is as offensive as it is absurd. To achieve the desired effect, the IWPR reporters make vague claims, engage in fanciful speculation, and falsify logic. "Many bookstores," they say, sell the Protocols of the Learned Elders of Zion, the anti-Jewish tract concocted by the Tsarist Russian secret police over a century ago. How many? Which ones? Would it be so hard to mention a specific example, so one may establish if they are fringe enterprises or mainstream booksellers? After all, there is most certainly a difference between, e.g. "Uncle Adolf's Racial Rack" and "Barnes & Noble." But the IWPR does not say, and does not care. Then they mention a "list of Jews in Serbia" posted on the neo-Nazi site Stormfront, supposedly posted by someone in Serbia, "most Serbian commentators conclude." Again, who is "most"? There are all sorts of commentators in Serbia, dozens of whom would be delighted to accuse their country and people (both of which they loathe) of the vilest things. Just so I don't commit the same transgression I accuse IWPR of, I'll mention the roster of columnists for the daily Danas as an example. Any opinion can be had for the right price, and having many rich sponsors, IWPR certainly doesn't lack money. "Other experts agree that Serbia is becoming a hotbed of extreme racist ideologies – partly a consequence of a decade of warfare under Slobodan Milosevic, when the media painted Croats, Muslims and Albanians as the demonic enemies of innocent Serbs." Not only is this a brazen thesis reversal of the obvious truth (that Croats, Muslims, Albanians and the mainstream Western media demonized the Serbs as enemies of innocent whoever - and this article is part of that demonization legacy!) but further down in the article, they contradict themselves! According to the Serbian Jewish leader Aca Singer, "anti-Semitic incidents have increased since the fall of the Milosevic regime in October 2000," and that "In the past five years over a hundred anti-Semitic books have been published in Serbia." But if anti-Semitism supposedly exploded once Milosevic was gone, how could it be his fault? Singer "believes this may be because the advent of democracy has released feelings about Jews that were previously well concealed." So, Serbs have always been evil, but the evil Milosevic held them in check?! Where does this nonsense come from?! IWPR does quote one specific case of anti-Semitism, a small "Christian" publishing house called IHTUS, which has published the notorious "blood libel" and other anti-Semitic diatribes. Its owner is a former member of a pre-WW2 fascist movement, who recently returned from decades of living in - the United States. The above-mentioned Stormfront is hosted in - the United States. "Serbian Defence [sic] League," another site they mention, is also hosted in - the USA, and owned by a U.S. resident who claims to be a Serb. So far, all that these examples of "Serbian anti-Semitism" have in common is their American origin. But IWPR does not claim America is anti-Semitic, does it? IWPR reporters also target Obraz, a conservative movement reviled by Serbia's Jacobins, claiming that since its website threatens "Zionists," it is anti-Semitic. But are "Zionist" and "Jew" one and the same? Can one be Jewish and not advocate the establishment of the Jewish State? I'd suggest asking the Hassidic Jews, and other Orthodox Jewish groups, who emphatically reject the esablishment of Israel as sinful. Are they anti-Semitic? The "woman on the street" dared question the sacred orthodoxy of victim politics: “Jews use anti-Semitism on purpose to gain privileges for themselves," she reportedly said. However, when Singer argues that “The penal code should include a provision on anti-Semitism as a criminal offence,” as he does just a few paragraphs away, does he not prove her right? Why should libeling Jews be a special criminal offfense, but libeling Serbs one of the most profitable enterprises in the news media today? What's truly tragic about all this is that there is a campaign of anti-Semitism in Serbia, but conducted by a Hungarian nationalist organization "Youth movement of the 64 counties" (HVIM), which has been organizing projections of a Hungarian-made political documentary "Trianon." The film, which advocates the resurrection of the pre-1918 Hungary, is reportedly anti-Semitic (see the RFE/RL Newsline for January 11, 2005, Southeastern Europe, penultimate paragraph). The Serbian authorities are not going after HVIM, probably because they fear a campaign of accusations they are "persecuting Hungarians," like the one launched last summer. But actual anti-Semitism and Hungarian irredentism don't interest the IWPR; they don't reflect badly on Serbs, so something must be made up that does. The Open Society Fund, the Foreign Office and the State Department should give their propagandists a raise. They are doing an excellent job. NATO's occupation force in Kosovo will receive a 600-strong reinforcement contingent at the end of this week, reports AP. The soldiers, along with 200 vehicles, will stay through mid-April, as part of an "operation aimed at showing the alliance’s ability to reinforce its peacekeepers in the troubled province," NATO said. The operation is codenamed "Determined Effort 2005". Now why would KFOR possibly send mobile reinforcements, under the banner of "determined effort" no less, into Kosovo right around the anniversary of the 2004 pogrom, and amid unconfirmed reports that "Prime Minister" and KLA chieftain Ramush Haradinaj has been indicted by the Hague Inquisition? Color me cynical, but methinks they are attempting to forestall another Albanian riot. But since the troops they are sending are just worthless Germans, maybe it's all just for show. Chris Deliso's post called my attention to the International Herald Tribune editorial from yesterday, titled "Waiting on Kosovo." It showed up in the New York Times today as well, under the title "Still Troubled After All These Years." "Troubled" is the right word, and how! At first I expected more pro-Albanian, pro-independence talk. After all, this is the paper that published an op-ed by ICG chairman Gareth Evans on January 25, calling for immediate independence for Albanian Kosovo. The NY Times, ran an op-ed by Carlyle Group's Frank Carlucci a month later, repeating the ICG line. And though the editorial did surprise, in this particular respect it did not really disappoint. "Setting a detailed timetable to independence, with a promise that Kosovo will neither be partitioned nor fall back under Belgrade, simply rewards bad faith... [The Contact Group] "should clearly and forcefully set out what Kosovo needs to accomplish and work should begin immediately on a settlement, at least temporarily including provisions for a semi-autonomous zone for the Serbs. That would choke off the Serb minority’s hopes of seizing control again. The Albanians should need no further incentive to behave properly." Three times in the article (and above is just one of them) the editors speak with a tone of disgust and disdain of the prospect of Kosovo returning to Serbian control, never quite explaining why this would be wrong. If Serbia has "forfeited sovereignty" over Kosovo by the supposed "abuses" of Albanians - a favorite argument of ICG's, by the way - then why haven't Albanians forfeited their claim just as much, by terrorizing Serbs and others? The editors do say that "Kosovo Albanians have trampled the rights of the Serb minority in a fashion not easily distinguishable from the treatment they justly complained about at the hands of the Serbs." Actually, that might be the problem. The Serb "treatment" the Albanians "justly" complained about is shrouded in the fog of misinformation, fabrication and outright lies. Albanians allege systematic discrimination, from mass firings and school poisoning to ethnic cleansing and even genocide. But at the first serious sign of questioning, their stories explode like soap bubbles. That is not to say that some state abuse didn't happen, but let's face it, state abuse is a fact of life in post-Communist Eastern Europe. Serbs complained of state abuse by Milosevic, even though he was never as tyrannical as DOS in the aftermath of the Djindjic Assassination. Which leads me to the final point, one that reveals the IHT's point of departure: "Slobodan Milosevic no longer wields tyrannic [sic] power and a bloodlust for cleansing every ethnic minority," they write. A bloodlust for cleansing every ethnic minority - are these people from the Moons of Jupiter? Do they not know that Serbia is the most multi-ethnic of all the Successor States? Yet they published Nicholas Wood's piece just the other day, on how Muslim Serbians are now studying "Bosnian" - a language invented just a few years ago, and one they never spoke - and thinking of themselves as "Bosniaks." Belgrade is not only not "repressing" them, the whole endeavor is being sponsored by the Department of Education! There are large numbers of Croats, Albanians, Ruthenians, Hungarians, Wallach, Roma and many, many others in Serbia. Granted, not all of them felt entirely welcome during the wars (and Muslims in the United States do nowadays, right? ), but there they are still. Where are the Serbs of Knin, Drvar, or Zenica? Or Pec, Pristina, and Podujevo? Moreover, where are the Roma, Turks, Gorani, Ashkalli, and others who used to live in Kosovo? Gone! The "bloodlust for cleansing every ethnic minority" wasn't Milosevic's, but Albanian. What's worse, the vast majority of Albanian abuses took place with NATO troops (some 65,000 at the outset) and the UN mission in attendance. Unlike the "crimes" of Milosevic and the Serbs - which despite the resources of the "international community" and the Hague Inquisition remain mostly speculation (and that's a generous euphemism for "vicious lies") - Albanian persecution of Serbs is a well-documented fact. The NYT/IHT editors expect Albanians to "behave properly" if the Contact Group promises them Kosovo would never return to Serbia. What they don't understand is that Albanians are behaving properly - for a value system in which brute force is the judge of righteousness, and whatever succeeds is deemed virtuous. It's a value system the Empire seems to share, for all its hypocritical harping otherwise.